At Bearspaw Christian School, we work together to make Christ the center of everything we do. We view every aspect of school as an opportunity for discipleship. All subjects are presented from a biblical worldview which frames students’ thinking around God’s truth. It portrays a reality where the world was created and is sustained by God, where God has acted in history to accomplish his purposes and is actively working now and into the future to reconcile all things to himself through Jesus. However, BCS is not just about building knowledge and a Christian way of understanding. It is also about imitating Christ in our way of living. Jesus calls us to follow him, which means offering him our whole selves. Without exception, BCS’s staff members and Board of Directors proclaim Jesus as their Lord and Saviour. Staff members commit themselves to helping students and one another grow in spiritual, social, personal, and intellectual maturity in order to become more like Christ. Our goal is to inform, invite, and inspire our students to pattern their lives after Christ’s example. We believe each student has been uniquely made by God and given a particular set and measure of gifts, talents and abilities. BCS inspires students to excel academically, physically, emotionally, and spiritually to reach their personal God-given potential. BCS consistently ranks among the top schools in the Fraser Report ranking for Alberta High Schools. At the elementary level, BCS provides a solid educational foundation, instilling knowledge, skills and attitudes necessary for preparing students to be successful at the secondary level. We strive to set up all students to be successful and to engage in lifelong learning. BCS strives to keep costs down for families with 3 or more children enrolled by capping tuition at a maximum per family. To help us keep BCS affordable, we need your continued support. We provide opportunities throughout the year for families to get involved with fundraisers and volunteering. At Bearspaw Christian School, we believe that impacting a generation for Christ requires the full cooperation of the home and the school. This is such an important task that we have to be in it together. Parents, grandparents, staff and students are all called to use their unique gifting and resources to further God’s kingdom. This requires us to live in real community. BCS has an effective team that collaborates with our families. Our dedicated Resource team partners with parents to provide the services to meet students’ individual needs. Our Discipleship Director facilitates teaching nights for parents to discuss culturally relevant topics and recommends resource material to equip parents to get biblically-based conversations started at home. Parents meet weekly to pray for the school, students and their families. Compassionate care is extended for the specific needs of our school community, and provides opportunities to serve each other. Bearspaw Christian School’s campus occupies an incredible 39 acres of land in Calgary’s northwest. We are located at 15001 – 69 Street NW, Calgary, just off 144 Avenue NW, and are easily accessible from Royal Oak, Nolan Hill, Sage Hill, Beacon Hill, Evanston and Symons Valley. As part of our mission to join with the family, we are committed to providing busing service to help parents get their students to and from school and home reliably and conveniently. 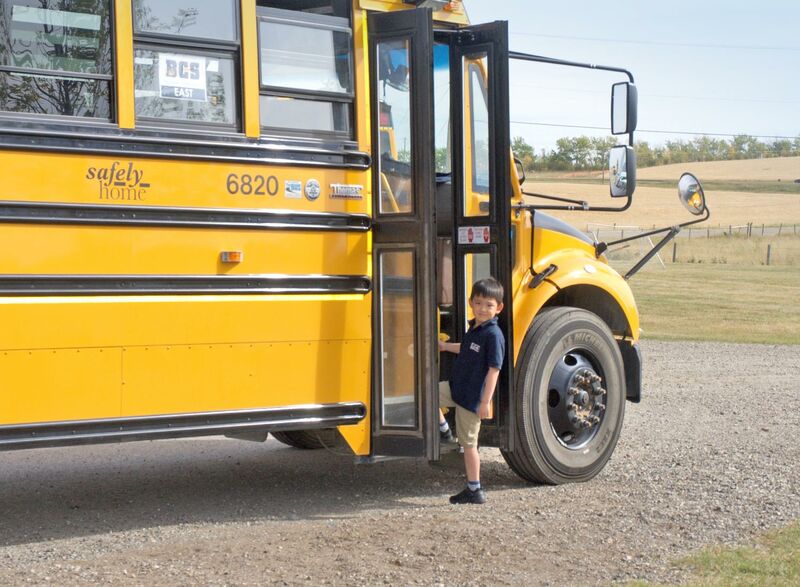 BCS students who ride the bus every day are precious cargo; we are dedicated to ensuring their safety, as well as having a transportation service that parents can trust.